1.Nienaber CA, von Kodolitsch Y, Petersen B, et al. Intramural hemorrhage of the thoracic aorta. Diagnostic and therapeutic implications. Circulation. 1995;92(6):1465-1472. 2.O’Gara PT, DeSanctis RW. Acute aortic dissection and its variants. Toward a common diagnostic and therapeutic approach [editorial; comment] [see comments]. Circulation. 1995;92(6):1376-1378. 3.Shimizu H, Yoshino H, Udagawa H, et al. Prognosis of Aortic Intramural Hemorrhage Compared With Classic Aortic Dissection. Am J Cardiol. 2000;85:792-795. 4.von Kodolitsch Y, Csosz SK, Koschyk DH, et al. Intramural hematoma of the aorta: predictors of progression to dissection and rupture. Circulation. Mar 4 2003;107(8):1158-1163. 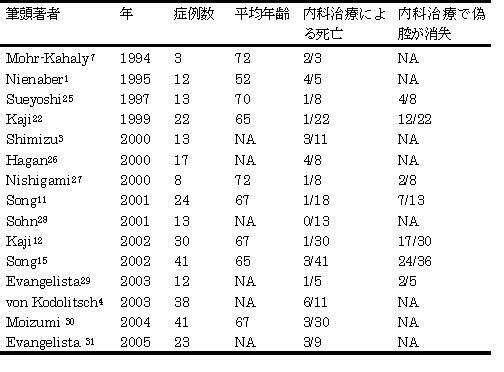 5.2004-2005年度合同研究班報告. 大動脈瘤・大動脈解離診療ガイドライン（2006年改訂版）. Circ J. 2006;70(Suppl. IV):1569-1677. 6.Robbins RC, McManus RP, Mitchell RS, et al. Management of patients with intramural hematoma of the thoracic aorta. Circulation. 1993:II1-10. 7.Mohr-Kahaly S, Erbel R, Kearney P, et al. Aortic intramural hemorrhage visualized by transesophageal echocardiography: findings and prognostic implications. J Am Coll Cardiol. 1994;23(3):658-664. 8.Vilacosta I, San Roman J, Ferreiros J, et al. Natural history and serial morphology of aortic intramural hematoma: a novel variant of aortic dissection. Am Heart J. 1997;134(3):495-507. 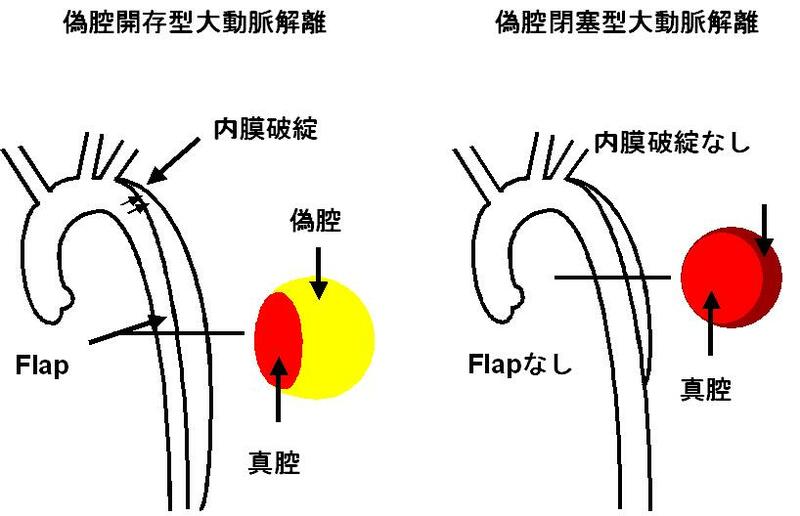 9.Matsuo H. The thrombosed type of aortic dissection-its clinical features and diagnosis. International Journal of Angiology. 1998;7:329-334. 10.Yamada T, Tada S, Harada J. Aortic dissection without intimal rupture: diagnosis with MR imaging and CT. Radiology. 1988;168(2):347-352. 11.Song JK, Kim HS, Kang DH, et al. Different clinical features of aortic intramural hematoma versus dissection involving the ascending aorta. J Am Coll Cardiol. May 2001;37(6):1604-1610. 12.Kaji S, Akasaka T, Horibata Y, et al. Long-term prognosis of patients with type A aortic intramural hematoma. Circulation. Sep 24 2002;106(12 Suppl 1):I248-252. 13.Kaji S, Akasaka T, Katayama M, et al. Long-term prognosis of patients with type B aortic intramural hematoma. Circulation. Sep 9 2003;108 Suppl 1:II307-311. 14.Song JK, Kang DH, Lim TH, et al. Different remodeling of descending thoracic aorta after acute event in aortic intramural hemorrhage versus aortic dissection. Am J Cardiol. 1999;83(6):937-941. 15.Song JK, Kim HS, Song JM, et al. Outcomes of medically treated patients with aortic intramural hematoma. Am J Med. Aug 15 2002;113(3):181-187. 16.Hayashi H, Kawamata H, Kumazaki T. [Thrombosed type aortic dissection showing changes in the false lumen to the patent type]. Nippon Igaku Hoshasen Gakkai Zasshi. Nov 25 1994;54(13):1217-1224. 17.Matsuo H. Recognition and Management of Thrombosed Type of Aortic Dissection With Long-term Follow-up Results. International Journal of Angiology. Jan 2000;9(1):27-30. 18.Tittle SL, Lynch RJ, Cole PE, et al. Midterm follow-up of penetrating ulcer and intramural hematoma of the aorta. J Thorac Cardiovasc Surg. Jun 2002;123(6):1051-1059. 19.Murray JG, Manisali M, Flamm SD, et al. Intramural hematoma of the thoracic aorta: MR image findings and their prognostic implications. Radiology. 1997;204(2):349-355. 20.Mohr-Kahaly S. Aortic intramural hematoma: from observation to therapeutic strategies. J Am Coll Cardiol. May 2001;37(6):1611-1613. 21.Pelzel JM, Braverman AC, Hirsch AT, et al. International Heterogeneity in Diagnostic Frequency and Clinical Outcomes of Ascending Aortic Intramural Hematoma. J Am Soc Echocardiogr. Jul 3 2007. 22.Kaji S, Nishigami K, Akasaka T, et al. Prediction of progression or regression of type A aortic intramural hematoma by computed tomography. Circulation. 1999;100(Suppl II):II-281-II-286. 23.Song JM, Kim HS, Song JK, et al. Usefulness of the initial noninvasive imaging study to predict the adverse outcomes in the medical treatment of acute type A aortic intramural hematoma. Circulation. Sep 9 2003;108 Suppl 1:II324-328. 24.Sueyoshi E, Sakamoto I, Uetani M, et al. CT analysis of the growth rate of aortic diameter affected by acute type B intramural hematoma. AJR Am J Roentgenol. Jun 2006;186(6 Suppl 2):S414-420. 25.Sueyoshi E, Matsuoka Y, Sakamoto I, et al. Fate of intramural hematoma of the aorta: CT evaluation. J Comput Assist Tomogr. 1997;21(6):931-938. 26.Hagan PG, Nienaber CA, Isselbacher EM, et al. The International Registry of Acute Aortic Dissection (IRAD): new insights into an old disease. Jama. Feb 16 2000;283(7):897-903. 27.Nishigami K, Tsuchiya T, Shono H, et al. Disappearance of aortic intramural hematoma and its significance to the prognosis. Circulation. Nov 7 2000;102(19 Suppl 3):III243-247. 28.Sohn DW, Jung JW, Oh BH, et al. Should ascending aortic intramural hematoma be treated surgically? Am J Cardiol. Apr 15 2001;87(8):1024-1026; A1025. 29.Evangelista A, Dominguez R, Sebastia C, et al. Long-term follow-up of aortic intramural hematoma: predictors of outcome. Circulation. Aug 5 2003;108(5):583-589. 30.Moizumi Y, Komatsu T, Motoyoshi N, et al. Clinical features and long-term outcome of type A and type B intramural hematoma of the aorta. J Thorac Cardiovasc Surg. Feb 2004;127(2):421-427. 31.Evangelista A, Mukherjee D, Mehta RH, et al. Acute intramural hematoma of the aorta: a mystery in evolution. Circulation. Mar 1 2005;111(8):1063-1070.